Canva’s wide collection of fully-customizable templates makes designing DIY announcements fun, quick and easy. Whether big or small, we like to measure or mark our lives with milestones. Events like births, weddings, new jobs or even moving to a new address are worth celebrating and sharing with our families and friends. Mark these occasions and spread the word with an extra-special announcement card you designed personally via Canva. Even with little to no design skills, you can easily create the perfect announcement design with Canva. Begin by browsing and picking one of the amazing, professionally-designed announcement templates. Once you’ve got one that caught your eye and matches your theme or need, it’s a simple matter of editing the elements within such as images, illustrations, fonts, colors and more to fully-customize and personalize the design, turning it to your very own. Create a new Canva account to get started with your own announcement design. Canva’s intuitive interface and easy to use design tools give you full control over the design templates. With a few clicks, you can change fonts (there are over a hundred fresh fonts in Canva), or pick a new color from the full spectrum of the color wheel. Move things around by dragging them to where you want them to go and resize images or icons by clicking and dragging on their edges. You can even edit on the go by adding Canva to your iOS and Android mobile devices. Just download our free apps from the App Store or Google Play. 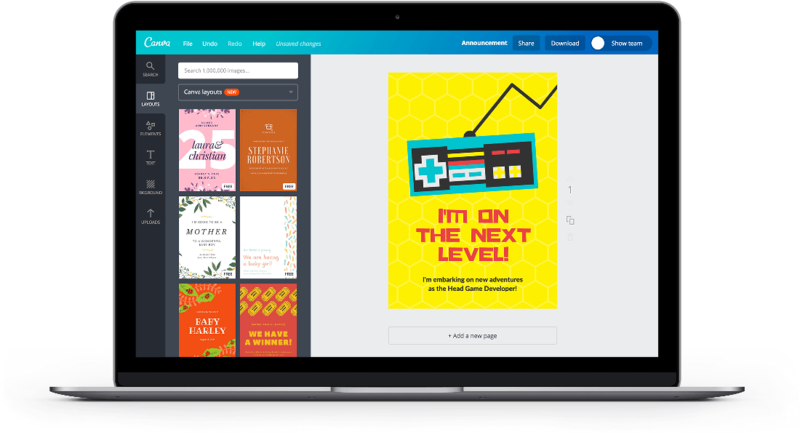 Canva hosts a vast media library of over a million high quality stock photos and illustrations you can simply drag and drop into your design. Each one is carefully reviewed and curated so your designs are sure to look great whether printed or on the screen. There are plenty of free images in the Canva library and you’ll never have to pay more than $1 for each one-time use of premium elements. Want to use your own photos? It’s a simple matter of dragging and dropping files from your computer and into Canva. Or, click on the upload button, search for the right file, then confirm upload. Once stored in your personal folder, the images will remain there, ready to be used for your next design. Once you’re all done with designing, it’s time to send out your announcement to everyone. You can post it on your Facebook, Twitter or LinkedIn account, send out as an email, or download it for printing. Your design can be saved as print-ready PDF, high-res PNG or JPEG file.